Recovering one day at a time. I’m sorry that I’ve been a little quiet on the blog lately. I’ve been recovering from unexpected surgery to my leg. Many of you know that I’m a bone cancer survivor. Along with aggressive rounds of chemo, I underwent a limb salvage surgery (thankfully) that removed and replaced most of my femur, knee and upper part of my tibia with titanium. Inside of the knee joint that keeps the femur and tibia rods together are a hinge and plastic pieces (and a bunch of other parts). I have always known eventually those parts may need to be replaced, particularly with how active I am. Well that time arrived a few weeks ago. As you may recall, I rode across Iowa with Team LIVESTRONG during RAGBRAI. It was a wonderful time, with our team raising more than $185,000 for LIVESTRONG’s programs and services for people with cancer. My leg had no complaints during the trip, nor when I returned. A few days later, however, an odd ache began in my (replaced) knee area. It’s of course common to have some aches and pains in this leg, and I’m super sensitive to these. I’ve made it a mission to know and listen to my body. This ache was a bit new so after a day or two, I called my surgeon. His first thought was tendonitis after all of my activity. But because infection can be devastating with any foreign object in our bodies, I went to see him. Long story short, it wasn’t tendonitis nor infection (thank God), but it was signs of my knee parts wearing out. So in a whirlwind of conversations, appointments and decision-making, I had surgery to replace these parts. Thankfully the surgery was successful and three weeks later, I am recovering well. My surgeon and physical therapists commented several times how pleased they are with my progress. You all know I am not one to sit still, so admit recovery has been a bit….well, I work to not get impatient nor frustrated as much as I work to recover physically. Haha. But I am so proud of my body for being strong and healthy. I continue to feel grateful that I am here, 20 years post-treatment, with my own two legs. Work with your care team. I can’t express enough how blessed I feel to have my care team, from doctors to nurses to physical therapists to lab techs and more. Throughout the past 20 years, I have been so well cared for by kind, talented people. The surgeon who did my original cancer surgery (sadly) retired a few years ago (we thankfully still communicate often, and he provided great support through this ordeal) and his replacement moved out of state last year. I met my current surgeon at the beginning of this year and thankfully developed a good rapport with him. He’s smart, talented and patient with the zillion questions I ask. When we decided to do this replacement surgery, several conversations occurred between the two of us so I could ensure he understand my concerns, goals and active lifestyle. I had the same conversation with my physical therapy team. I feel very confident that we’re on the same page, they understand my perspective, I understand theirs and they are 100 percent committed to my health and goals. That takes some major stress and anxiety off one’s shoulders. I highly encourage everyone to have open conversations with your care team – it’s your health and life. Set goals. 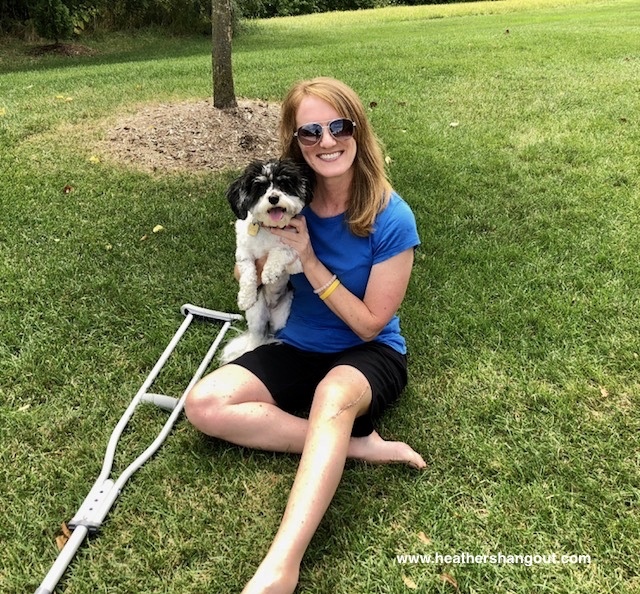 When I set the date for my surgery, I also set the deadline date for walking without crutches – I’m heading to Washington, DC for a cancer advocacy event in September and my goal is to board the plane without crutches. I shared that with my surgeon and again with my physical therapist after surgery. Both acknowledged the goal and are focused on it too. I hope to be on my road bike by October and back to Zumba in November. Be patient. I walked without a limp for 20 years, and refuse to walk with one now. That means I make certain I am strong and ready. My physical therapist reminded me the other day it has barely been three weeks, with more than two weeks until my original deadline of being completely off crutches. My surgeon also explained that his greatest concern is letting my muscle and tissue repair and recover before I start regular or strenuous activities (this conversation helped me greatly in recognizing there was a lot of ‘stuff’ done inside my leg). So while I admittedly stare at my bike resting in the garage or miss the quiet solitude of the hiking trails or sweating to awesome dance music in Zumba, I find patience to care for my body. I also have rediscovered great enjoyment of reading, writing and simply sitting at the local parks and lakes. Doctor’s orders say I sit and relax (wink). Little get well present to myself! Focus on your accomplishments. I, of course, want to be off crutches ASAP, however, I also know I am not going to rush recovery so I end up hurting myself long term. Days after surgery, my knee of course hurt and was tight, I couldn’t really weight bear on it. After a few days of physical therapy and being faithful about exercises at home, I could stand with equal weight on my legs and raise up on my toes. Then, the other day I walked up and down the physical therapy room without crutches, with no limp and no ache. It was so exciting! It’s these little steps (no pun intended) in progress that are huge steps for me. I know it will be months before I feel ‘normal’ again and the anxiety dispels, yet every day is a stronger day in recovery and my body is able to do more. I’m celebrating all of those moments. Reward yourself. I’m kind of big on being nice to myself. I mean, why shouldn’t we be nice to ourselves? It’s not selfish or silly. It’s important. So sometimes when I am focused on a goal, I tell myself that I will get a reward for reaching that goal. It’s often something small, like three Tim Horton’s TimBits instead of two, or new book or bracelet. Sometimes I go a bit bigger….my point is that it’s fun to stay motivated knowing a reward is waiting. 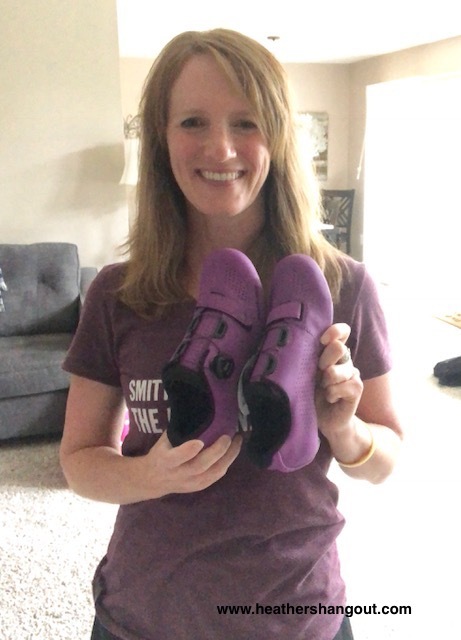 For instance, after I was able to stop using one crutch and walk a few steps across the living room, I rewarded myself with some gorgeous new cycling shoes. I am so excited to wear these when I can finally ride again. It may sound funny, but those shoes sit beside my fireplace so I look at them every day as a reminder to keep working toward my goals. It motivates me to continue with exercises at home and not get frustrated. Be patient is a huge one! My boyfriend is a bodybuilder who recently had shoulder surgery, and he’s been so frustrated with the whole process because of the long recovery. I understand the frustration (I’ve heard shoulder surgery is tough recovery due to rotation tightness, weight restrictions, etc). I hope your boyfriend heals quickly! Wow these are really great tips. Totally agree that patience is key to recovery. Thanks for the kind words. Trying to channel my inner lazy side to be patient, lol. These are great tips, thank you for sharing, I hope you have a quick and speedy recovery! These are really great tips on recovery! I had surgery a year and a half ago and recovery was easier than I expected but I definitely took my time with everything afterward! I agree that taking time to let our bodies heal is the best recovery!